Boat parades are cruising through the harbors along the Southern California coast. The season is here for merry maritime festivities along the coast of Southern California. As the winter holidays near, the boats on the harbors prepare to spread holiday cheer. 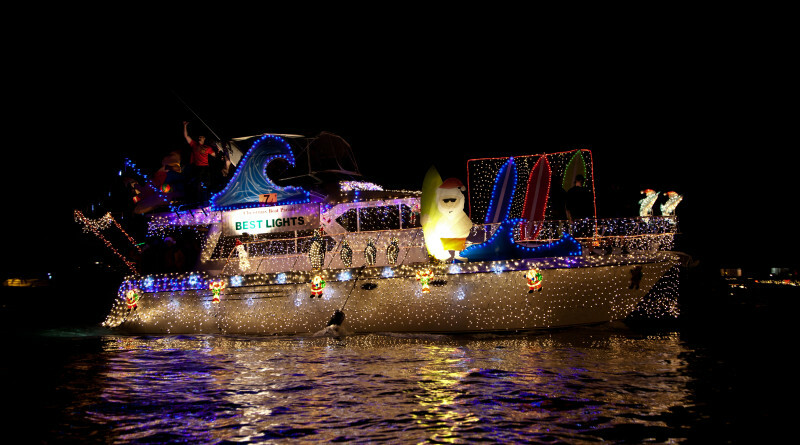 From kayaks to yachts, participants deck their craft with lights, decorations, and music too. 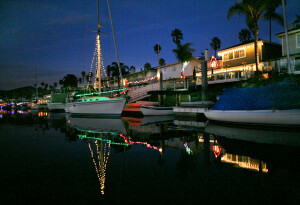 Each harbor along the Southern California coastline hosts annual holiday boat parades. 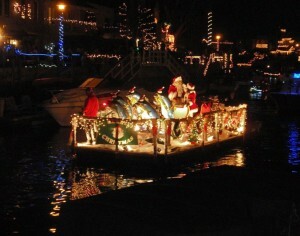 With mild winter weather from San Diego to Santa Barbara, it is no wonder the boat parades are so popular here. Details: The 45th Annual San Diego Bay Parade of Lights, presented by the Port of San Diego, is celebrating the San Diego Zoo’s 100th anniversary. The theme is “It Began with a Roar – San Diego Zoo Celebrates 100 Years.” Those boaters participating in both nights of the parade and viewed by the judges are eligible to win various awards and prices. The grand prize is a luxury cruise package for two with all the amenities of a private mega-yacht. The cost to participate is $60 which covers parade participation for both evenings and includes two complimentary reservations to the awards presentation dinner. Details: This annual holiday parade is expected to have more than 100 decorated boats with 60,000 spectators. Route: Decorated boats circle around Mission Bay starting from the Quivira Basin area. Viewing: Best viewing is from Riviera Shores, Crown Point, Santa Clara Point, the east side of Vacation Island and west side of Fiesta Island. Details: Oceanside Yacht Club presents the Parade of Lights. Boats participating must register and obtain a number to enter the contest. Deadline to enter is Dec. 10 at 2 p.m. There is no cost except a $5 refundable fee for number (used for judging) to participate. Participants can sign up at the Oceanside Yacht Club (OYC) during business hours posted on website oceansideyc.net. Best time to register would be at 2 p.m. December 10 at the Skipper’s Meeting. Viewing: The public can view the parade anywhere in the harbor. Information: Call OYC at 760-722-5721. 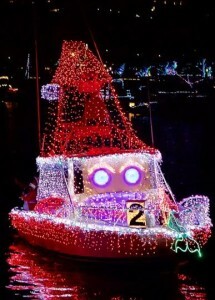 Details: The 42nd Annual Dana Point Harbor Boat Parade of Lights’ theme this year is “UNDER THE SEA.” Decorated boats will have a chance to win in awards for Judges Choice, Best Theme, Best Use of Lights, Best Animation, Most Colorful, Most Original, Best Sailboat, Best Powerboat and the Perpetual Trophy for the Yacht Club with the Most Entries theme. Viewing the parade is free. Pick up an entry form at Dana Wharf Sportfishing & Whale Watching, go online at danapointharbor.com/boat-parade-of-lights/ or call 949-496-5794. Time: 6:15 p.m. – 9:00 p.m. Details: The Newport Beach Boat parade is the nation’s longest running holiday boat parade. This is also the biggest harbor parade in California. The New York Times hails it as “one of the top ten holiday happenings in the nation.” This parade is hosted by the Commodores Club of the Newport Beach Chamber of Commerce. More than 100 decorated boats are expected to participate. The boat parade begins with fireworks at Newport Pier at 6:15 p.m. on Wed., Dec. 14 and ends with fireworks at Balboa Pier at 9:00 p.m. on Sun., Dec. 18. The parade will begin and end at the same place as previous years, located off Bay Island. The Grand Marshal Line-up leading the parade includes Mickey Mouse, Olympians, entertainers, a marching band and heroes. The cost to participate is $35 per vessel. 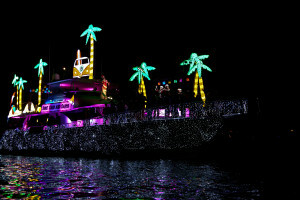 Participating boats can enter online at christmasboatparade.com/enter/. Route: The route of the parade can be viewed online at christmasboatparade.com/parade-route-and-schedule/. Viewing: The 14 mile parade course offers numerous viewing locations around the Newport Harbor. There are also certain restaurants that have waterfront dining with a view of the parade. Marina Park offers public parking. A detailed map with viewing locations and time frames can be found online at bit.ly/2g3T6dc. Allow extra time for travel and arrive as early as possible due to the crowds and traffic. Time: 5:15 p.m. to 9:00 p.m. Details: This year’s Huntington Harbour’s holiday boat parade theme is “Symphony of Lights.” New and previous participants are encouraged to display music and lights from all cultures. There are 16 trophies to be awarded to boating participants from various categories including “Most Religious” to “Best Commercial Entry.” The parade will be shown on Ch. 3 over the holiday season. Boat entries are due by Thursday, Dec. 8. To enter a boat in this parade, go online at hhboatparade.org/entries. Line up for the boat parade is at 4:30 p.m. Parade starts at 5:15 p.m. sharp. Details: In honor of Naples Island 70th Annual Boat Parade, the theme this year is “A Platinum Celebration.” On the night of the parade, all large boats will assemble along Lido Lane and off the sea wall in front of Naples Plaza. All the small boats will assemble in Marine Stadium. Small boats must be able to fit under bridges with an 8’ maximum height. No boat will begin until the #1 boat leading the parade has started. This event is hosted by the Naples Improvement Association. For those participating in this boat parade, a mandatory skippers’ meeting is being held on Wednesday, Dec. 14 at 7 p.m. at the Long Beach Yacht Club in the Regatta Room. Only boats with official parade numbers will be allowed in the canals. The entry fee is $45 per boat and $25 per kayak. Boat entry forms are available online at naplesca.com/Parade_Entry_Form.php. Route: Staging for boats is at Bay Shore Ave. in Marine Stadium. Boats will proceed under Appian Way towards Sorrento Drive and The Toledo, veer right to Sea Isle Drive toward Corso di Napoli, veer left into Naples Canal, right at Rivo Alto crossing under The Toledo Bridge, passes under Ravenna Dr. Bridge and 2nd The Toledo St. Bridge, passes under Neopolitan Ln. Bridge, goes left on Corso di Napoli toward Vista del Golfo past Naples Park Plaza, veer around Corso di Oro, past Lido Lane, veer left at Appian Way veers and ends at Long Beach Yacht Club and Marine Stadium staging area. A map is available online at bit.ly/2gihrgP. Viewing: Spectators can view the parade from the Naples’ canals and various bridges as well as along the bay. Free parking is at Alamitos Bay Marina off 2nd Street and Marina. Metered parking is at Mothers Beach off Ravenna and Appian Way. Beach parking is at Bayshore and Ocean Boulevard. There are public restrooms at Mothers Beach and at Bayshore and 2nd Street. Time: 4:30 p.m. – 10:00 p.m. Details: The 25th annual King Harbor Boat, hosted by King Harbor Yacht Club, will be honoring local heroes. The parade will have decorated boats and paddle craft circling the King Harbor Marina. Thirty power and sail boats as well as 75+ paddle craft (canoes, kayaks and stand up paddle boarders) are expected to participate. Entry form to participate is available online at bit.ly/2f2qfEH. Details: The theme of the boat parade in the Port of Los Angeles East Basin is “Hollywood at the Harbor.” The parade is also a fundraiser and toy drive. All toys and proceeds go to harbor area youth organizations and nonprofits for their holiday events. Donations can be made online or by-mail or drop off toys at the Skippers’ Breakfast, California Yacht Marina – Cabrillo Marina, or Pacific Yacht Landing, Berth 203, Wilmington. Toys and funds will be distributed during the second week of December. Route: The boat parade route begins in the Port of LA’s East Basin and ends in the Cabrillo Marinas in the Port’s outer harbor. 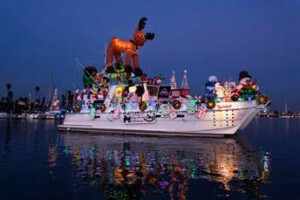 The parade route and viewing times for various locations are available online at laharborholidayafloat.org/parade-route-2/. Information: Henry Rivas 323-487-2101 or email harborparade@gmail.com. Information is also available online at laharborholidayafloat.org. Details: The 54th Annual Marina del Rey Holiday Boat Parade starts with fireworks. Fireworks’ site is on the jetty near the entrance of the main channel. Experience Christmas at the Marina’s Free Annual Holiday Boat Parade and Fireworks Display. Rain or shine, dozens of colorfully decorated boats circle the marina competing for the Grand Prize. The night’s festivities usually kick off with a 5:55 p.m. fireworks show, followed by the parade from 6 – 8 p.m. All boats begin circling the main channel of the Marina at 6 p.m. Traditional fireworks that annually noted the beginning of the boat parade will be shot off the south jetty of the marina at 5:55 p.m. The parade boats will be judged on Saturday evening. Parking at Burton Chace Park is available for $8 in County Lots #77 and #4. Pay stations take credit cards and cash. Parking is also available at Fisherman’s Village (cash only; $1 per 20 minutes, $15 max; pay attendant at exit). Details: The 51st Annual Channel Islands Harbor Parade of Lights celebrates the area’s silver screen history with the theme “Hooray for Hollywood”. This event is a full day and evening of family activities. Santa flies across the sky marking the beginning of the parade. Children’s activities and artists market will take place at Marine Emporium Landing: visit Santa (12 p.m. – 4 p.m.), play in the snow in the morning and enjoy strolling carolers in the evening (5:30 p.m. – 8:30 p.m.). Registering your boat not only makes you officially part of the parade, but automatically enters you into the competition for some great awards, the most coveted award being the perpetual “Sweepstakes Trophy.” All registered boats will be positioned between the Lead Boat and the End Boat. An online entry form is available at bit.ly/2fhk1kN. Route: The parade starts in front of Peninsula Park and heads to the Main Channel, turns at Hobie Beach, loops in front of the launch ramp then heads back to Pacific Corinthian Yacht Club and repeats the route for a second run. A route map is available online at bit.ly/2eWeXiK. Details: The Ventura Harbor’s 40th Annual Parade of Lights is celebrating 100 years of our National Parks. Start time is 6:30 p.m. End time is 9:00 p.m. Details: The Santa Barbara boat parade scheduled for Dec. 11 will start off with fireworks at 5:30 p.m. This year’s theme is the “Wild West Holidays.” The annual boat parade will have boats motoring, sailing, and paddling the Santa Barbara Coastline. Judging takes place at Stearns Wharf and boats are awarded donated cash and prizes in five categories. Event admission is free. A boater registration form is available online at bit.ly/2fGbLvk. Forms are also available now at the Waterfront Office, Harbor Market and Fuel Dock. Complete the form and turn in to the Waterfront Administration offices or email it to DSamario@SantaBarbaraCA.gov. Information: For more parade information contact the Harbormaster’s Office at 805-564-5531 or check online at bit.ly/2fYb14Z.